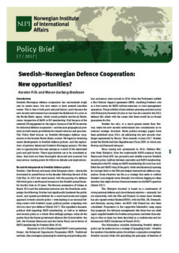 The changed security environment in the Nordic region following the Russian annexation of Crimea, actions in Eastern Ukraine, and the increased assertiveness in Northern Europe has added urgency to the idea of Nordic defence cooperation. From being a cooperation mainly focused on industrial cooperation and defence budgetary needs, NORDEFCO has shifted to emphasise security politics to a higher degree. As a result of these changes, it’s necessary for NORDEFCO to pursue an agenda more based on security politics where security, planning and operational goals are weighed more heavily. How is this going to affect the cooperation in NORDEFCO? What steps could be taken to create greater strategic synergies within NORDEFCO? Is it viable to extend NORDEFCO’s cooperation areas to include the Baltics? NUPI and the Norwegian Institute for Defence Studies (IFS) will cooperate on this project, in an effort to revisit NORDEFCO from a strategic/political angle. The project will include public seminars and some written publications. An important goal of this project is to stimulate to a debate about NORDFECO’s role in strengthening Nordic security and defence.